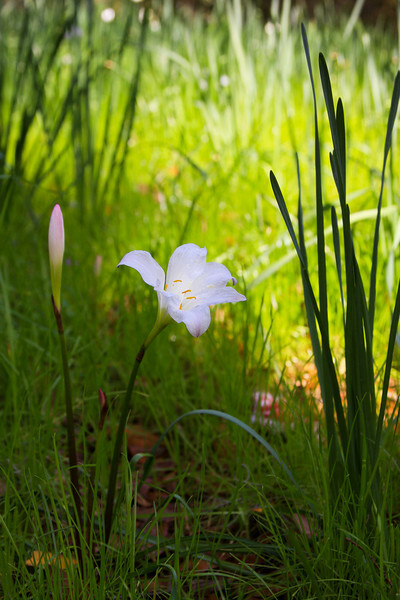 I hope everyone is having a wonderful Easter weekend. As always lately on holidays I enjoy watching the pictures of family get-togethers and happy children streaming in on Facebook. I was blessed myself this year since I have both of my children with me and I am feeling very fortunate. 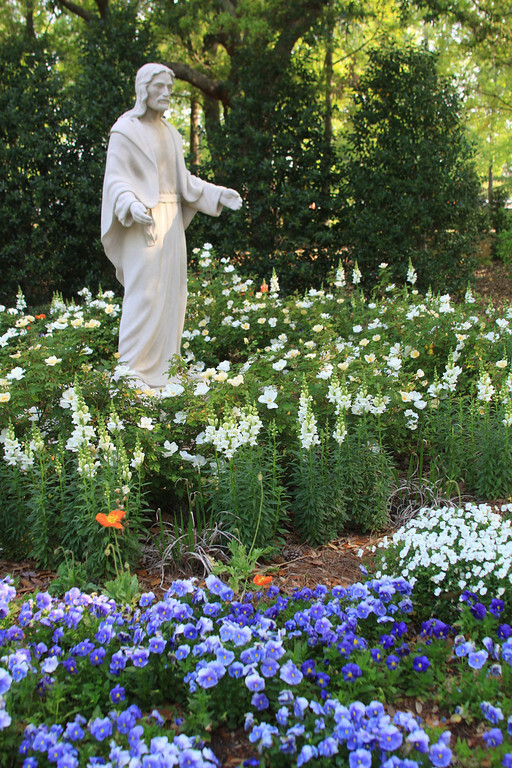 Today's photo is from the meditation garden at Bon Secours St. Francis Hospital. 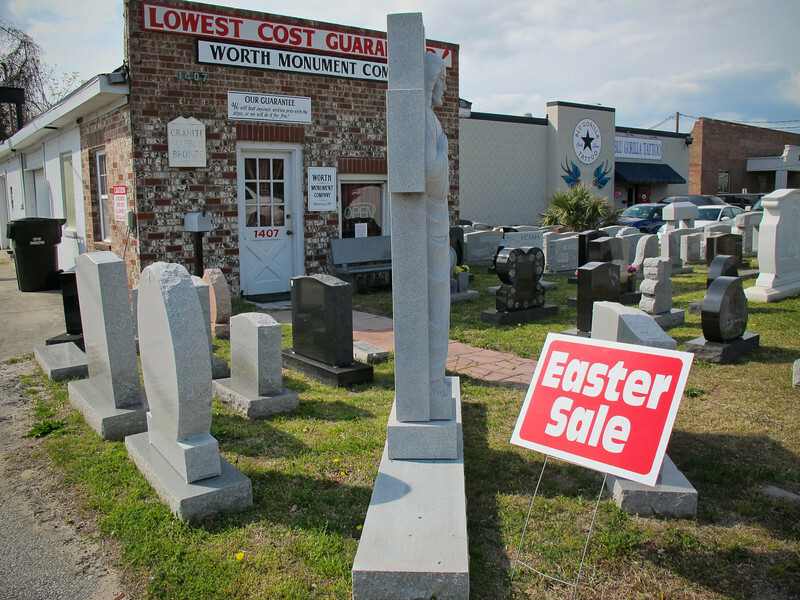 I thought it was the perfect image for Easter Sunday. 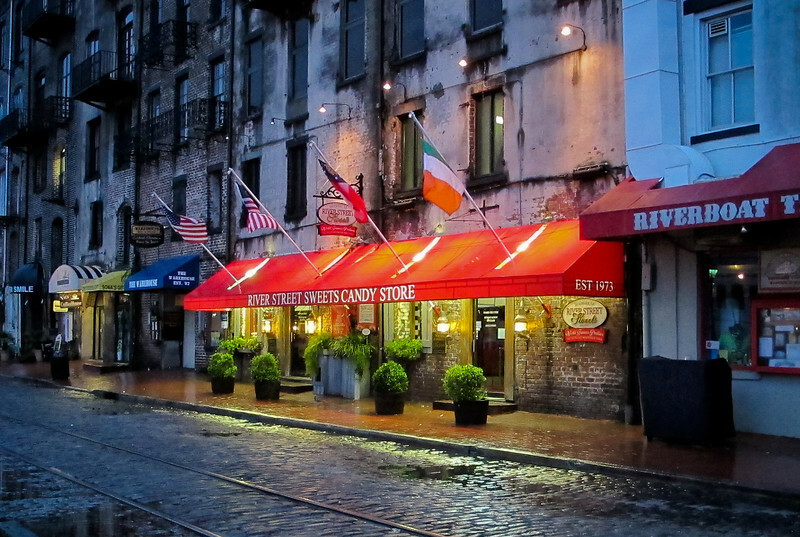 King & Broad, Charleston, S.C. 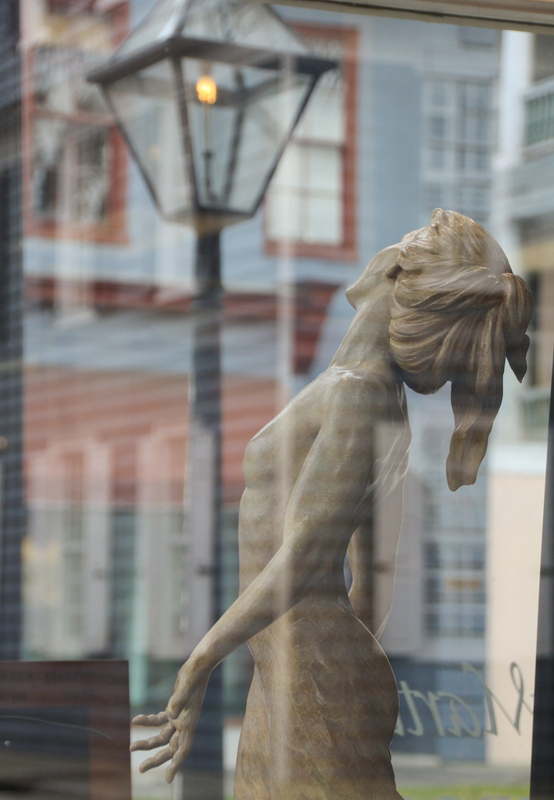 This gal was prancing around in the window of the art gallery at Broad & King St. having a perfectly joyous time. The photo below is of her hand from another angle. 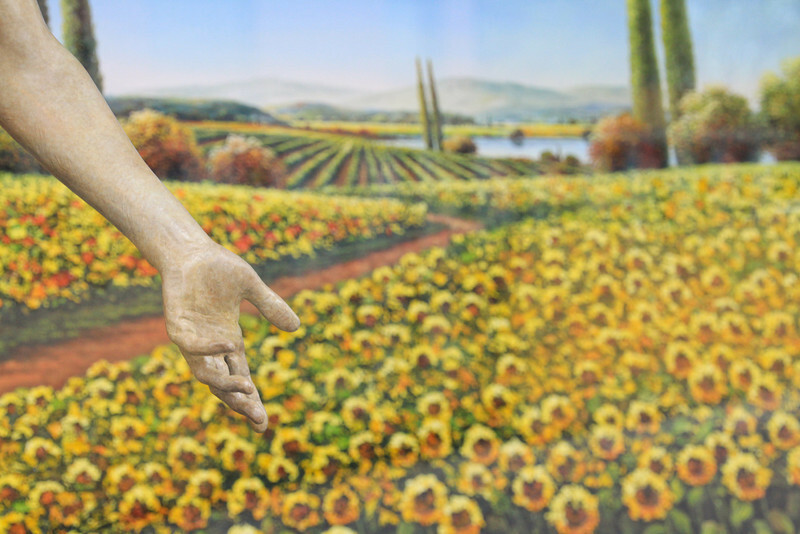 I believe it is the Mary Martin Gallery. I need to start walking with a pen and notepad. Yeah Friday! I got so much done today working peacefully without the phone ringing or hundreds of emails to respond to. I might start working on every holiday. My daughter arrives after midnight tonight (can't wait, can't wait!) so I am planning to sneak a couple of days off next week. 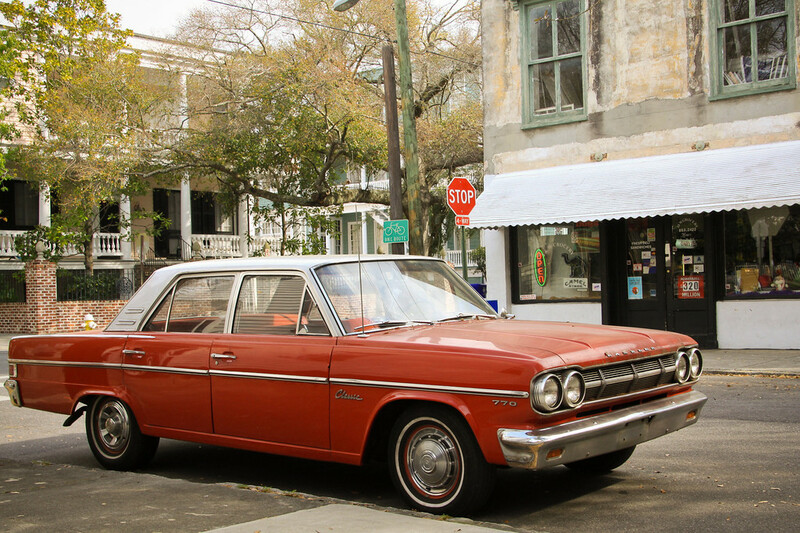 I've done entries on corner stores of Charleston before but had to take another shot of this one with the vintage car in front of it. There is something so much more charming about a corner store over a chain convenience store, isn't there? I believe the lottery sign on the door advertises that jackpot I had plans for but didn't win. Who is up for a long weekend? Not me yet. I am going to work tomorrow and take Monday off instead since my daughter is coming home. Woohoo! 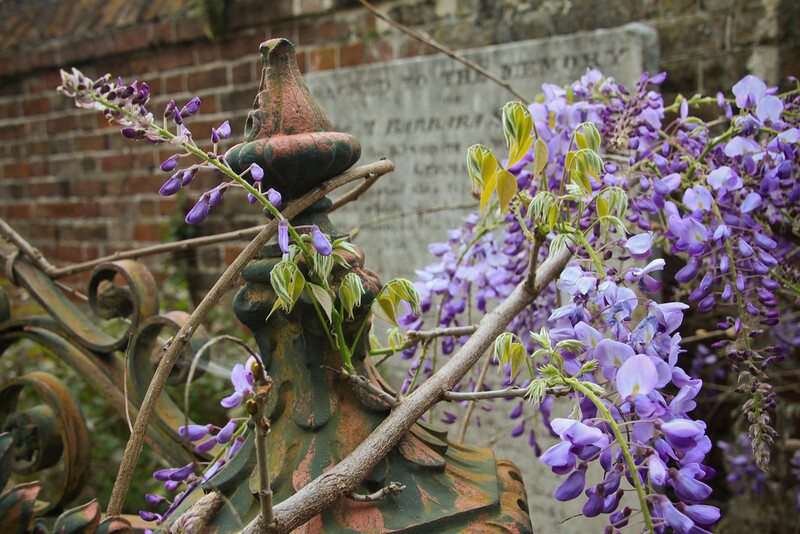 St. John's Lutheran Churchyard, Charleston, S.C. I fancy her, for she is fauve. inistic for her in her grove. 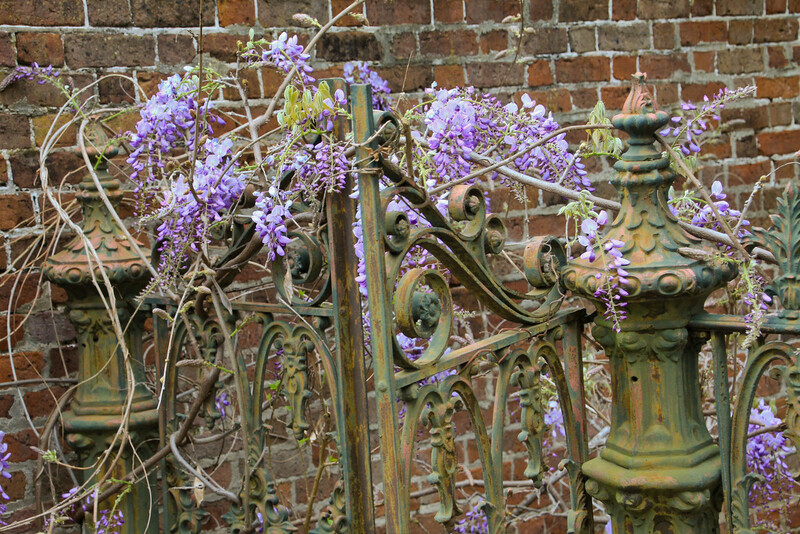 As I searched for a Wisteria related poem to go along with my images, I discovered that McClellanville has an annual Wisteria parade. I couldn't find any dates listed for this year but they may not be trying to draw outside attention to it. Cool! Mini Library at Black Tap Coffee Shop, Beaufain St., Charleston, S.C. I have been enchanted with some of the mini libraries people have been creating lately to make books available. This link shows them made from old newspaper boxes. 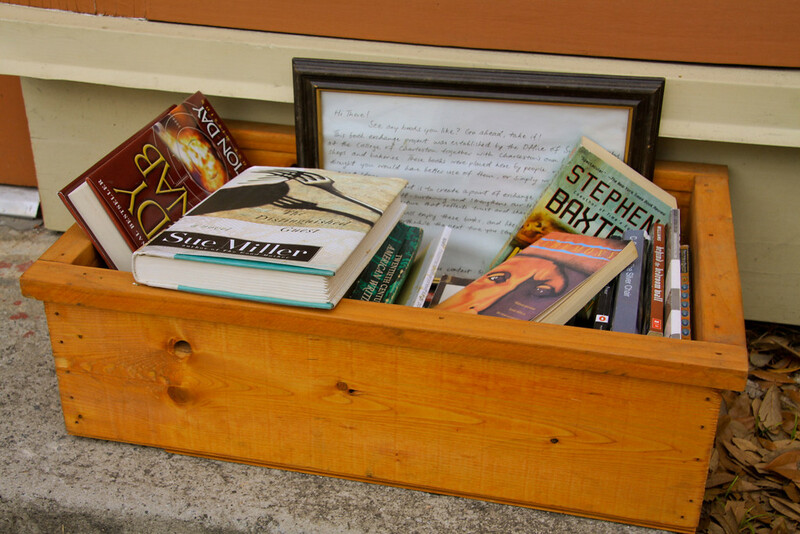 Check out these images of little libraries built for yards. So cute! I haven't seen any like that but I was tickled to come across this box of books in front of Black Tap Coffee Shop on Beaufain St. Thanks folks! 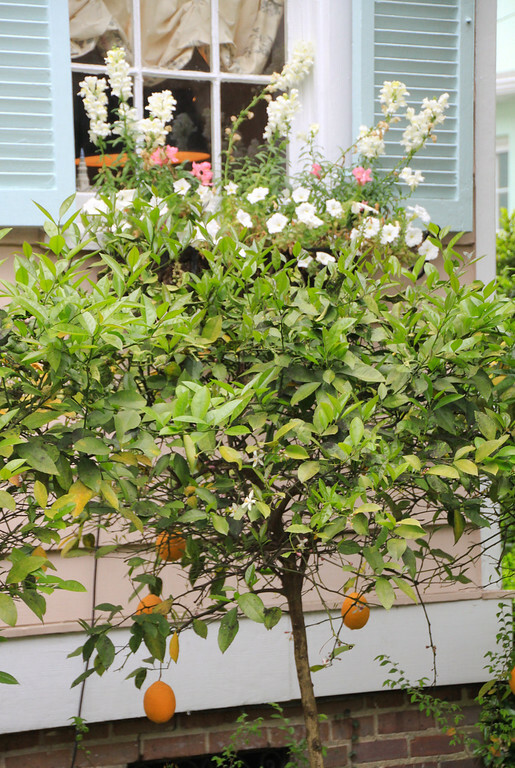 Curious here....what are the orange fruits hanging low? I am off to bed early. I have some sleep to catch up with. You kids turn the lights out. Don't stay up too late. Not quite the midnight train but close enough. 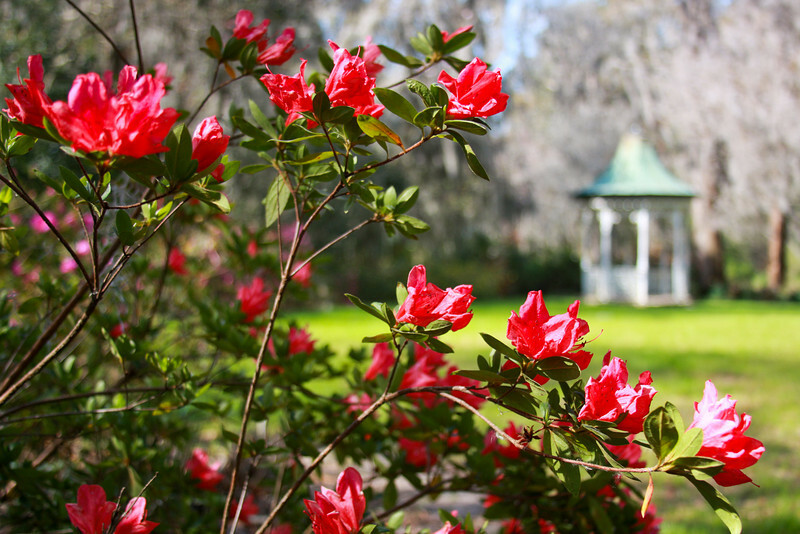 My sister Barbra and her husband emailed to say they were taking a snow break weekend in Savannah. Since they had come all the way from Canada I didn't want to miss the chance to see them. We expected rain all weekend so I had the brilliant idea to take the Amtrak train down the coast. It is a brilliant idea and everything went smoothly except for that fact that the train pulls up at 5:06 am (yawn). 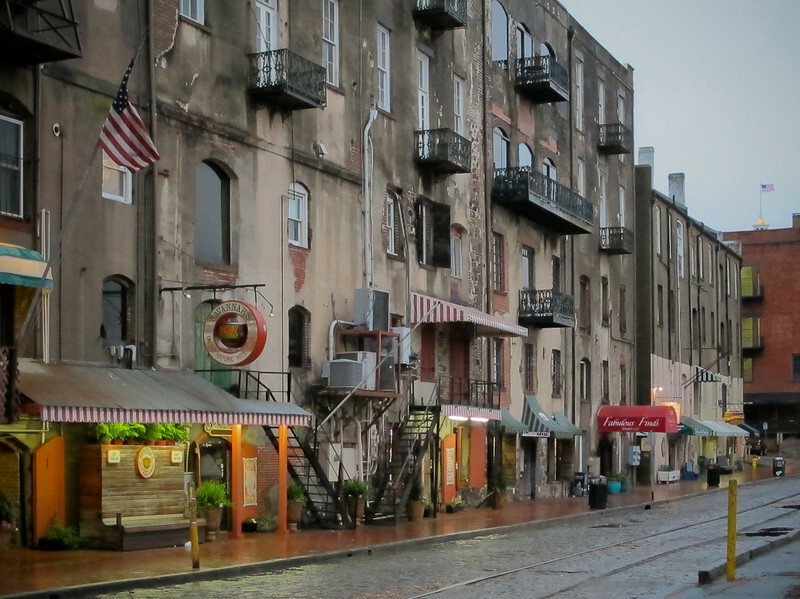 I arrived before sunrise and shared a cab into town with a couple of SCAD students on their way back from New York City. 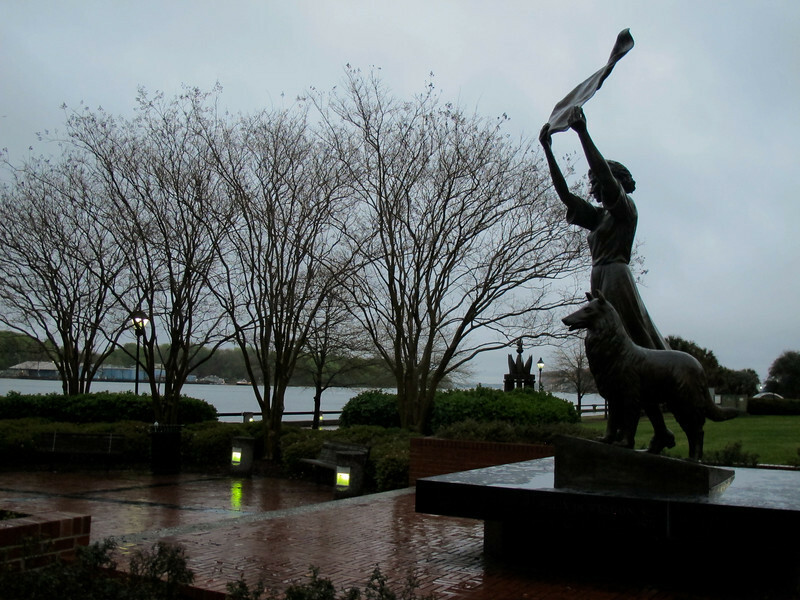 It was too early to awaken a couple on holiday so I wandered the cobblestone riverfront streets, grabbed a cup of coffee and visited the waving girl statue. It was great to see family and catch up. We had a yummy brunch, walked around Forsythe Park, took the movie tour and had a great dinner at Sage before they dropped me back off at the train station. The train was easy, efficient and clean. The only snag was the both routes up and down the scenic coast were done in the dark at this time of the year. 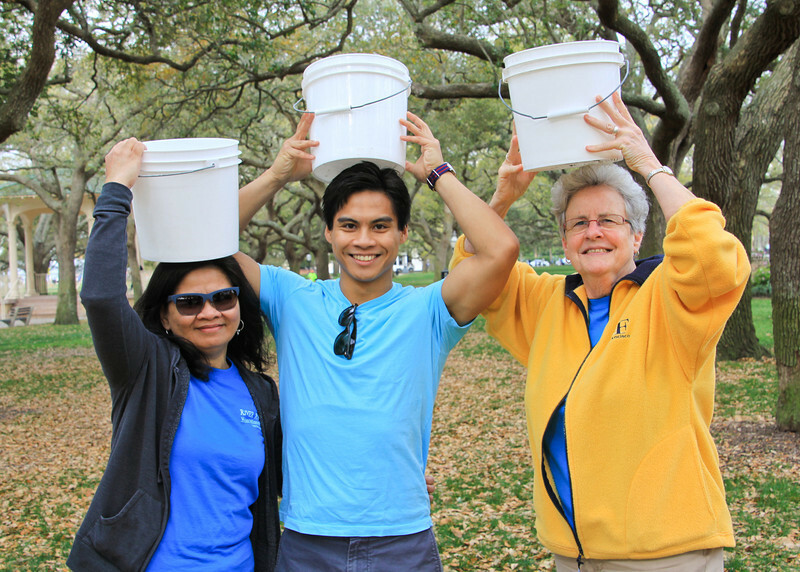 Charleston Walk for Water, Charleston, S.C. 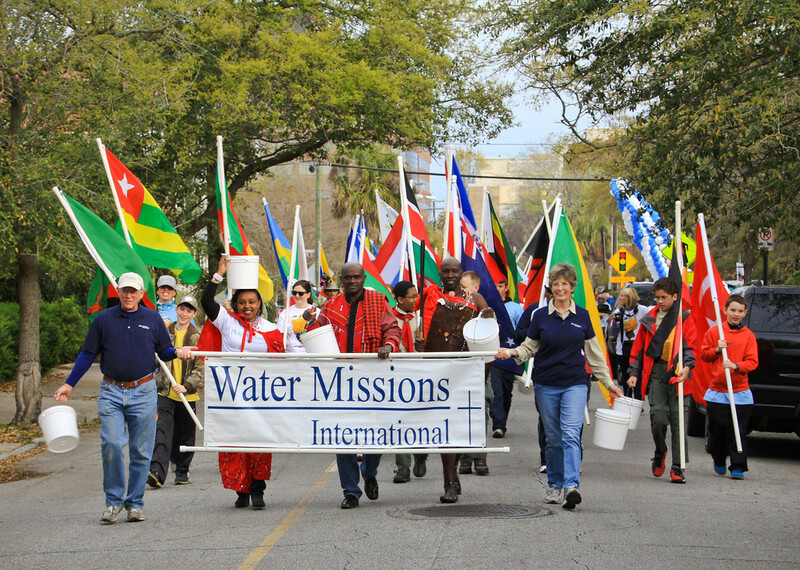 The rain held off just long enough for the 7th annual Walk for Water sponsored by Water Missions International to be a grand success. 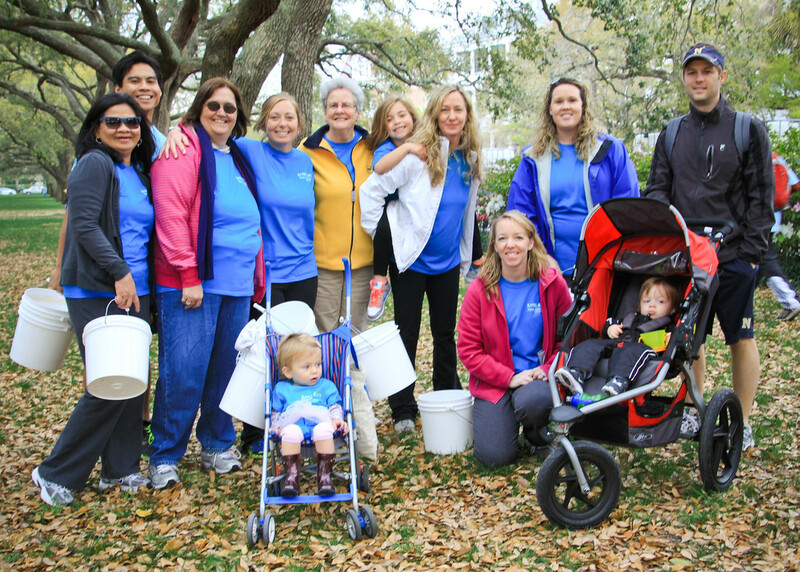 Raising money to provide safe water around the world, walkers carried empty buckets and filled them up half walk through the walk. I saw lots of familiar faces, co workers and friends. Thanks to everyone who supports this cause. I was one of the lucky ones who has seen this put into action when I went to Kenya a few years ago to document the installation of a water purification system for a small hospital and community. 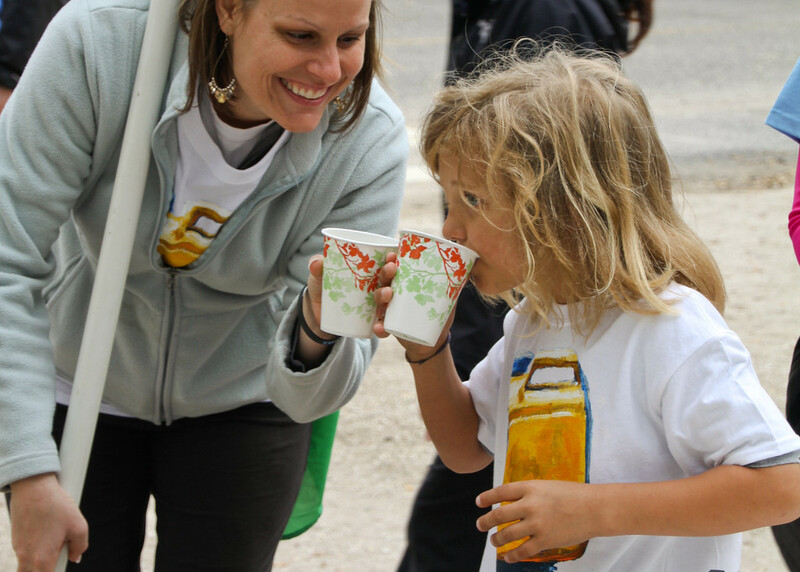 It has been grand hearing about the different clean drinking water has made. Ooopsie! 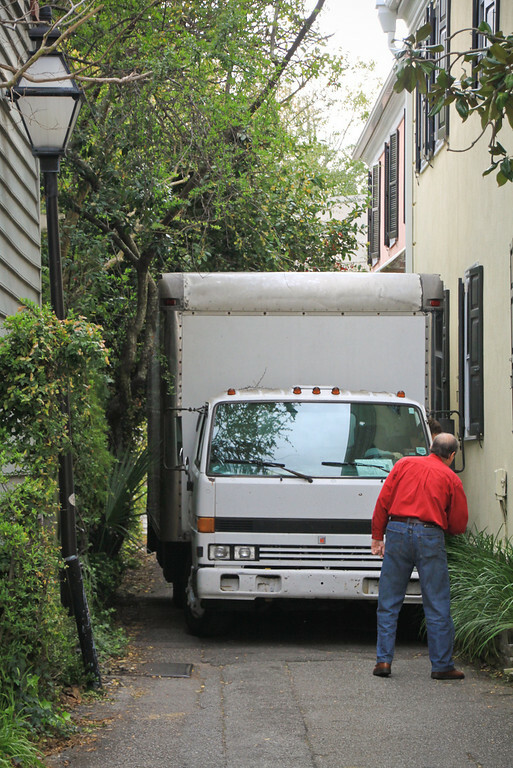 Charleston alleys are full of charm but can be tricky for practical purposes. I just got home from the Walk for Water but couldn't resist grabbing a shot of this on my return. I didn't stick around to find out if they made it. It is pouring rain. Stay dry! 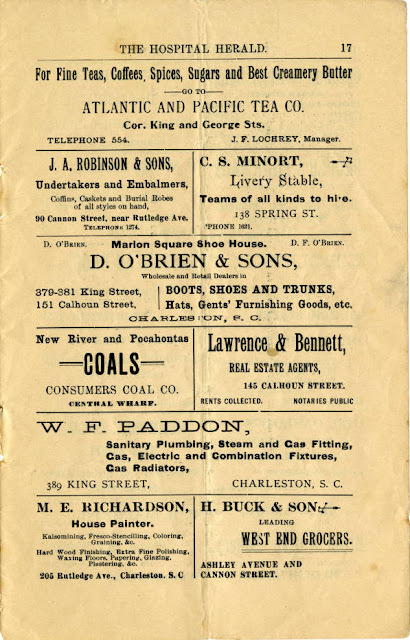 The Hospital Herald, Charleston, S.C. 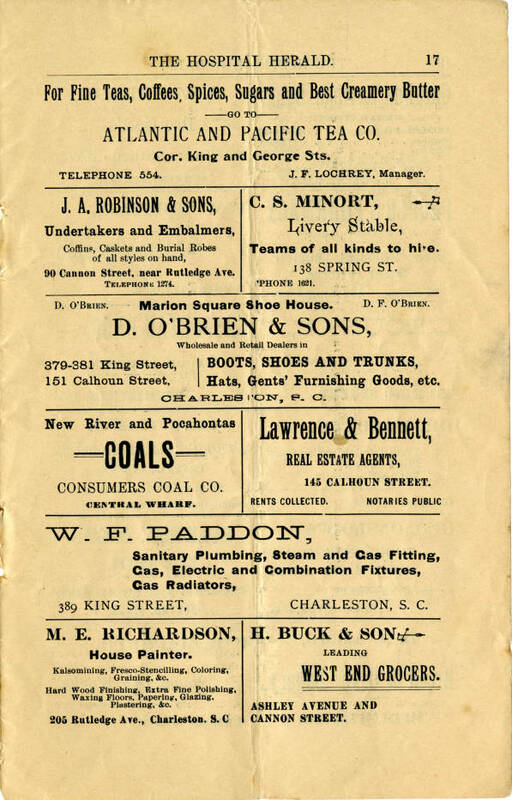 This is a page from the Hospital Herald, Charleston 1899. I have discovered that the Waring Library at MUSC has digitized the copies of the medical journal. 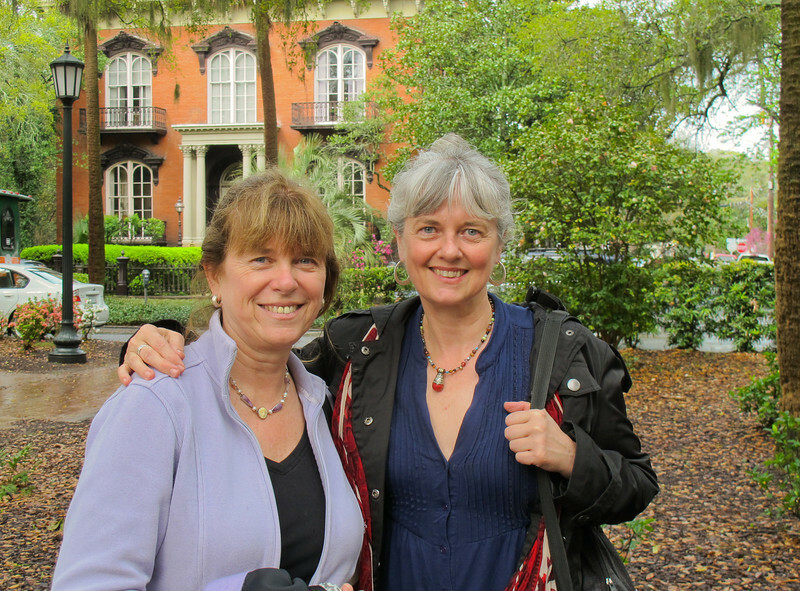 It is a fascinating glimpse at medical history in the lowcountry and I have been reading them all. 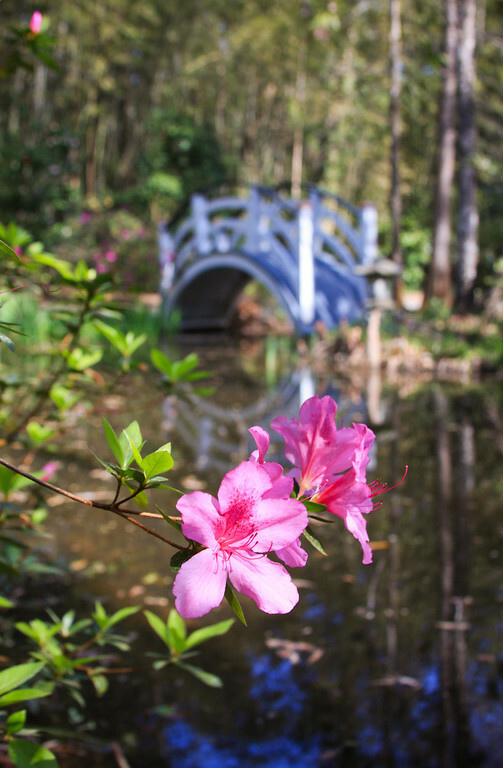 Copies of the journal can be found: Lowcountry Digital Library. 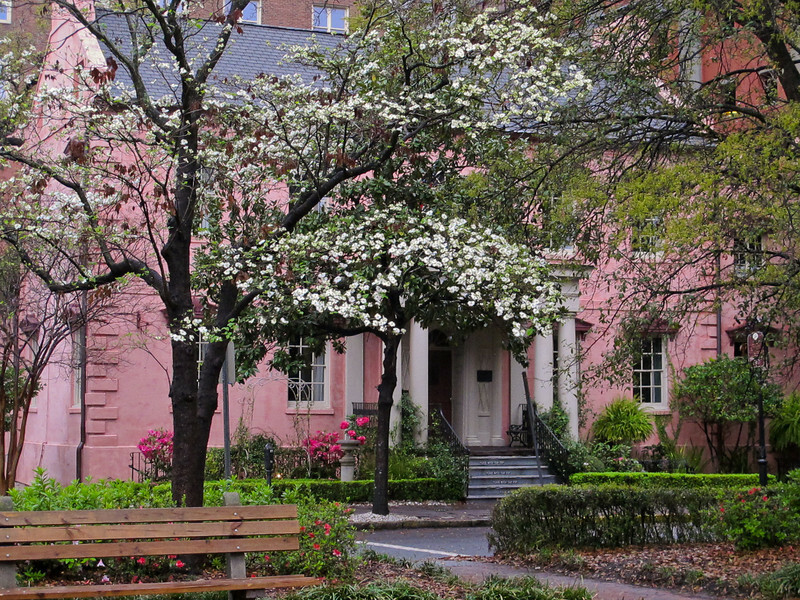 The Hospital Herald is described as: The Official organ of the Association of Colored Physicians of South Carolina, edited by Dr. A.C. McClennan, surgeon in charge of the Colored Hospital and Training School for Nurses at 135 Cannon St., Charleston, S.C. 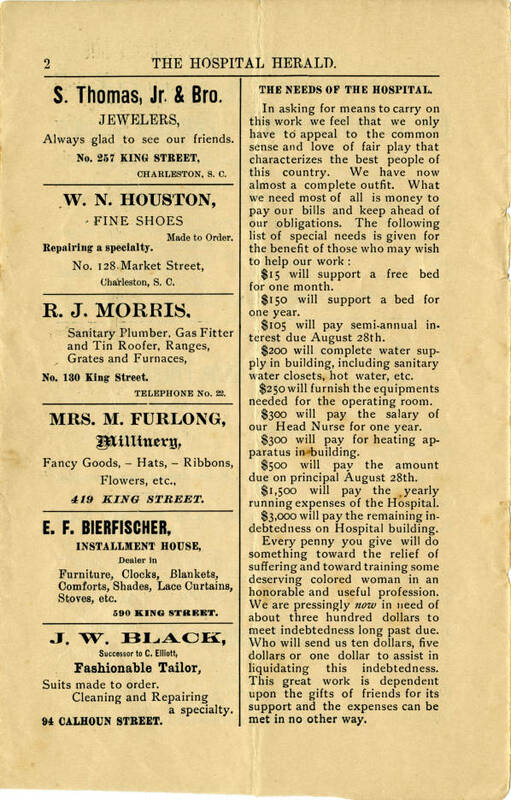 Topics discussed in this issue include the financial needs of the hospital and solicitations of donations for indebtedness. Other topics include winter illnesses, sanitation and hygiene, and nurse-training. How times have changed. They are hoping for donations of $15 to support a free bed for a month and $300 would pay the salary of the Head Nurse for a year. 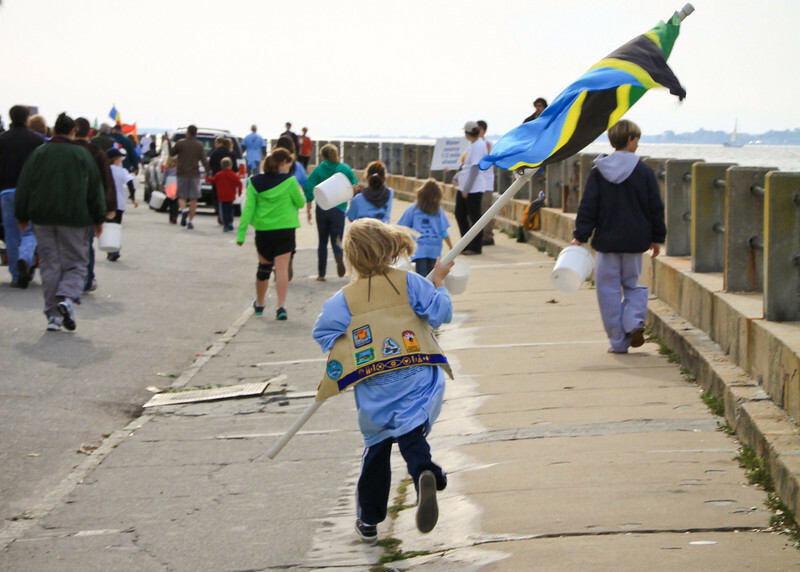 Click below to see local Charleston advertisers in the Herald. Charleston Fashion Week, Marion Square, Charleston, S.C. I joked a couple of years ago that the one festival I wasn't involved with at all was Charleston Fashion Week and wondered if it was because I tend to wear Dansko shoes. Heheh. This year, thanks to Charleston Magazine and the American Heart Association I was offered tickets to last night's fashion show. Lordy, I could have used up a camera card just taking pictures of women's shoes. No sensible Danskos in sight. It was an experience. 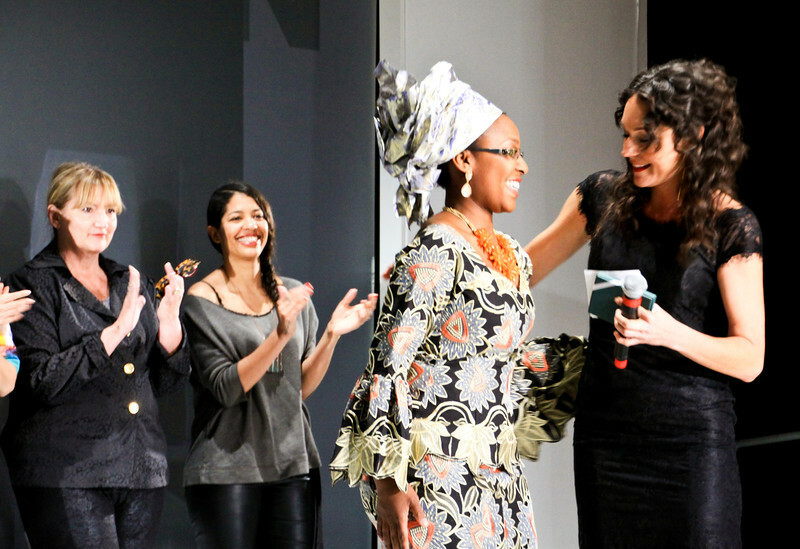 As I understand it, the entire event started as the brainchild of Ayoka Lucas pictured above and has blossomed into a very successful event. I wasn't seated in a place to get good pictures so just grabbed a couple to document the event. 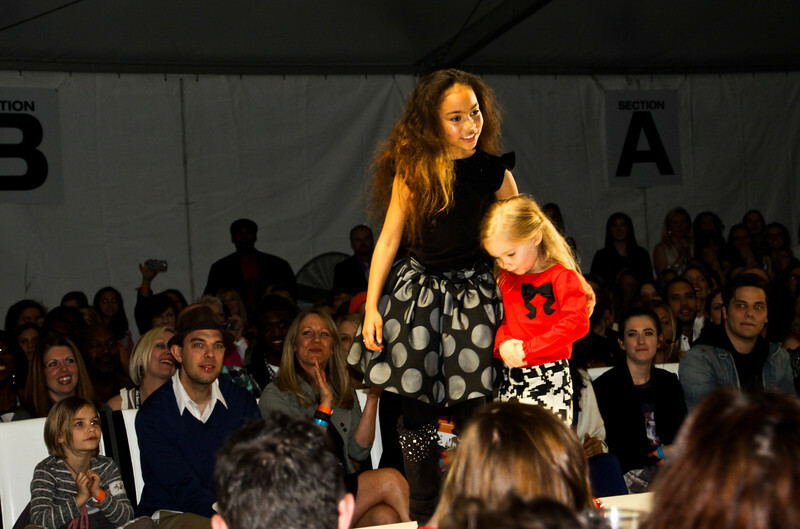 I have to admit that my favorite part of the night was the kid's fashions. They were so adorable. 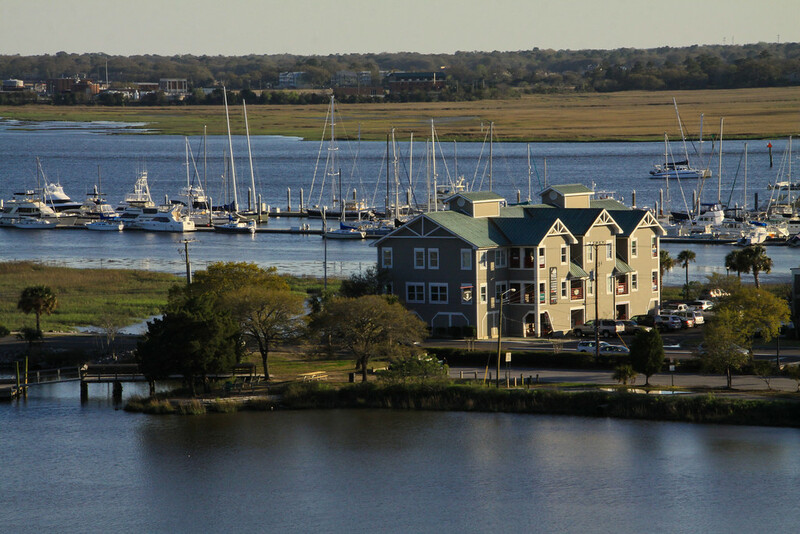 We get so excited about views overlooking the peninsula because we have so few high rise buildings in Charleston. Isn't this glorious? I hosted a career evening for students interested in Emergency Medical Services this evening at Roper Hospital. 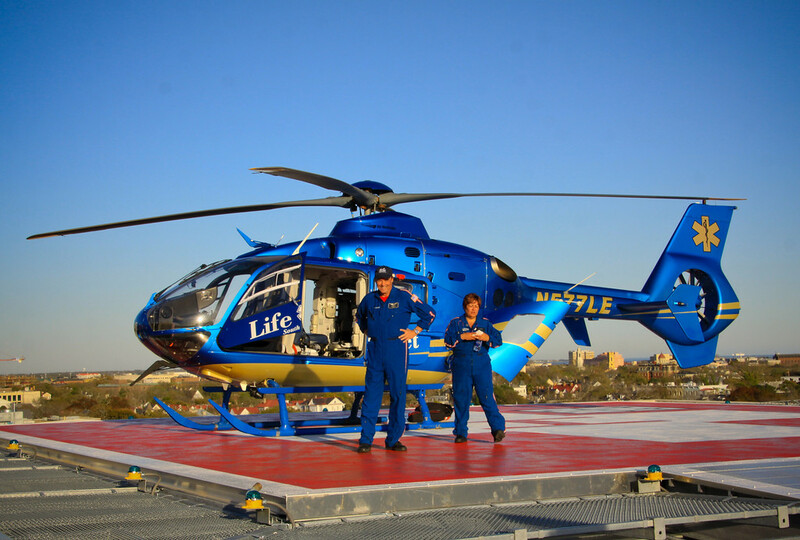 Besides the normal skills, ambulance ride etc. I had a special treat up my sleeve. I couldn't tell the students about it since I wasn't sure we could pull it off but we did. 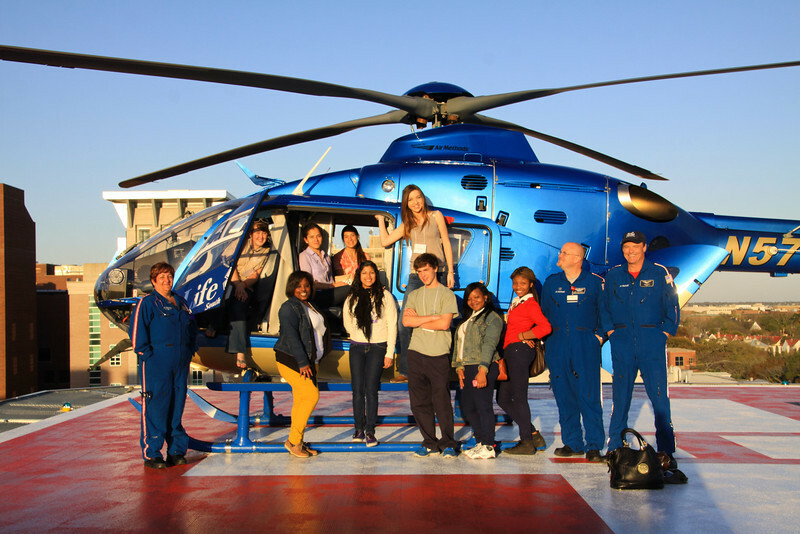 I took forty kids up to the roof of Roper Hospital and let them check out the helicopter and talk to the pilot and flight staff. I am not sure who was more excited - them or me! I need to get to bed, kids. Late night tonight and long day tomorrow. G'night. Your personal shopper - me! 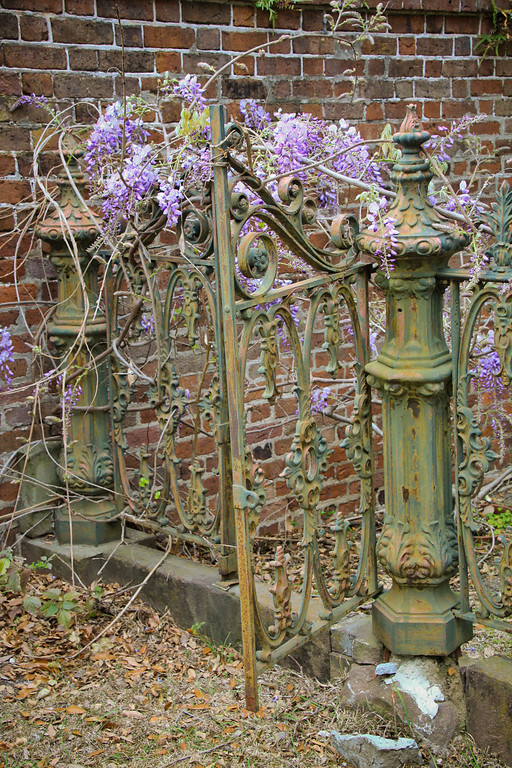 Clicking around the blogosphere, I realize I have been slacking off on blogging duties. There is a general tradition of displaying wares for readers to buy. I don't take pictures of myself trying on new outfits in fitting rooms, displaying my feet in new shoes or raving about purses or nail polish colors. Have no fear! I found a fresh exciting sale that no one else is promoting. 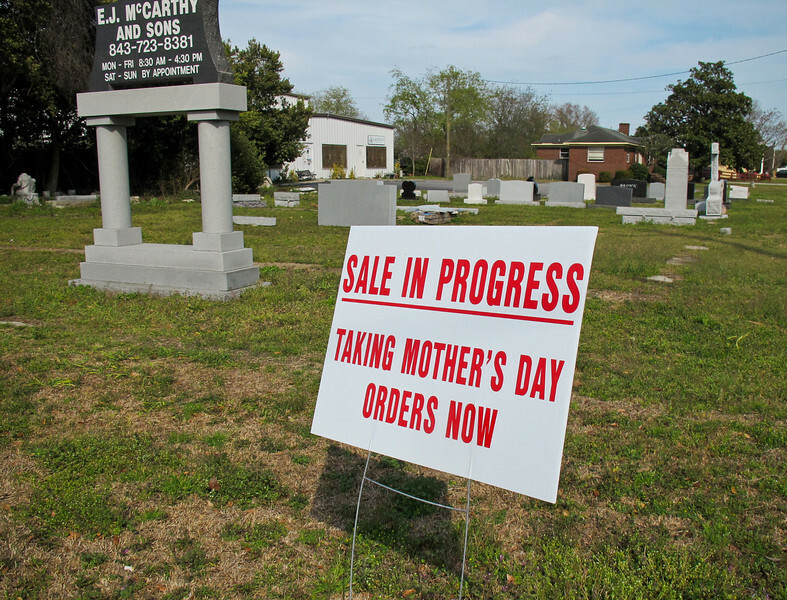 Who knew that tombstones went on sale for Easter and Mother's Day? Tell them I sent you. No promotional blog give-a ways to commenters. Sorry about that. Maybe next year after they get a rush of sales from my promotion. 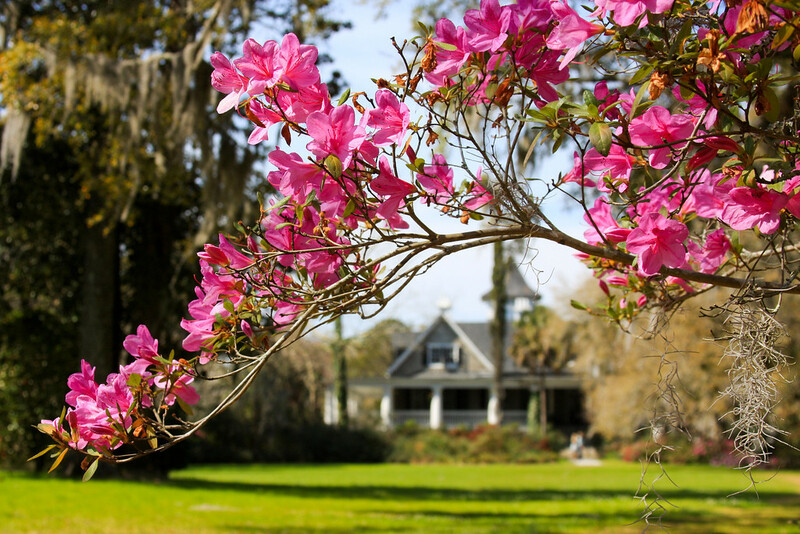 I go for a long walk every weekend morning and during the spring it is hard to resist walking through the gardens at Magnolia Plantation. Wow.....look at this. We aren't at peak blooming season yet but it is completely glorious. I did more stopping and admiring the flowers than I did quick marching. I renewed my annual pass so I will be back frequently. I hope everyone had a good weekend. If you didn't it wasn't because of the weather. Busy week ahead so I am lollygagging and watching the Army Wives sad episode. Sniff. 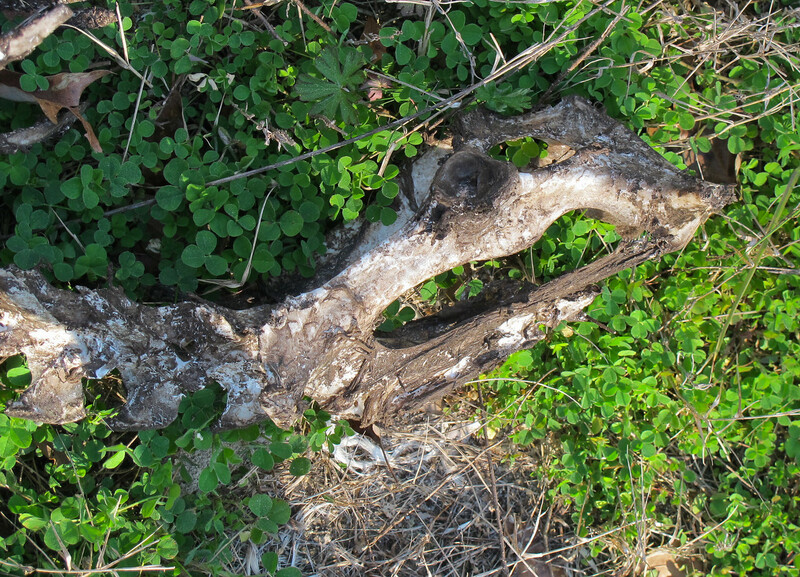 This evening we have a new game of "can you identify this carcass?". It isn't really a game but I am puzzled. 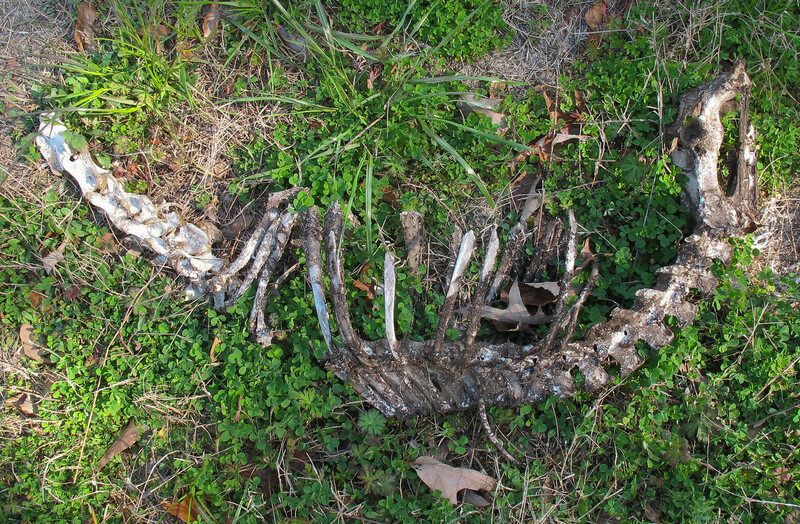 I was up around Lake Marion last night and found this on my bike ride this morning. I stood there scratching my head. There are no limbs or wings and it was the size of a small deer. What the heck is it? 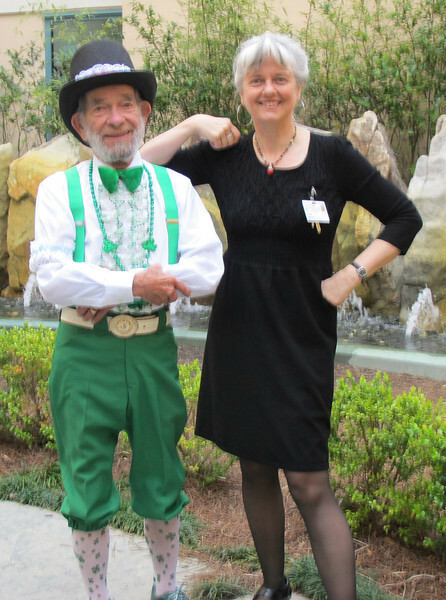 I have had a crazy day, kids and can always use some good luck so I was happy to see my favorite leprechaun this morning. 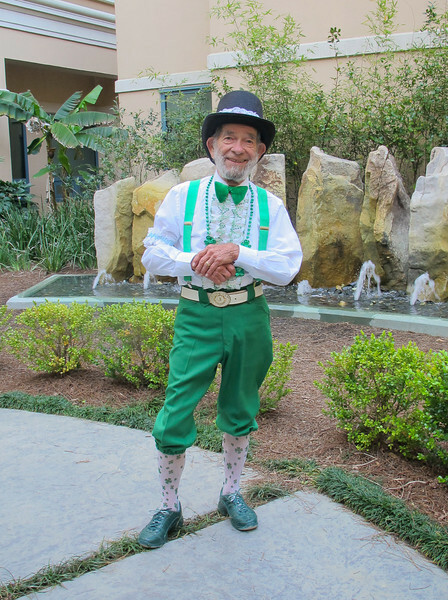 This gentleman will be 83 next month, still works and drops by the hospital each year for St. Patrick's Day with a basket full of candy to pass around. How cool is that. 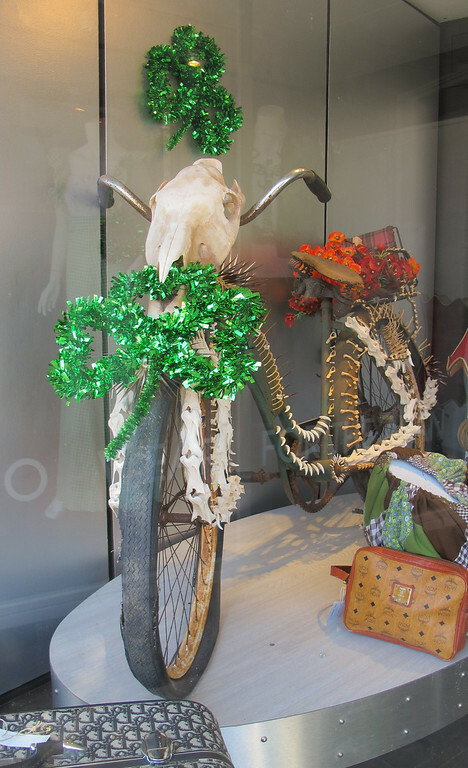 Even the skull bikes are turning green in preparation for St. Patrick's Day in the JLINSNIDER window display. Exotic doors on King St.
Indonesian Door panels, Seeking Indigo, Charleston, S.C.
Charleston is known for beautiful doors but this does stand out. 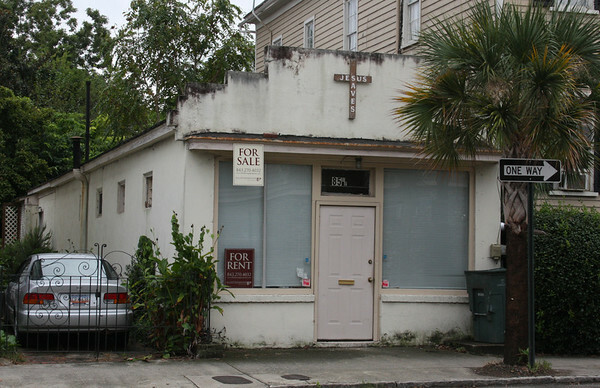 This is quite an amazing sight to find on King St. in Charleston. I am not, I repeat NOT, supposed to be shopping when I go for an exercise walk but I popped into Seeking Indigo to look at a sweater I saw in the window and spotted this inner entrance to their spa. I am not a spayee (like that spelling?) person for the most part but I was impressed with the Indonesian door. 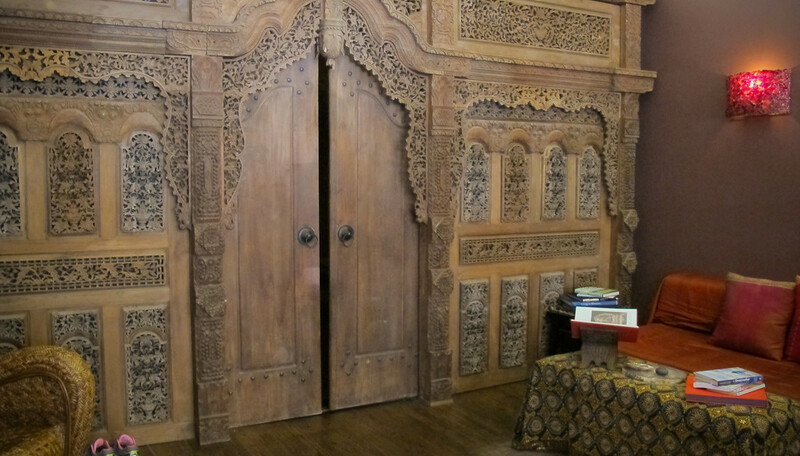 I am sure there is relaxing music, aromatherapy and tinkling bells behind the carved wooden panel. 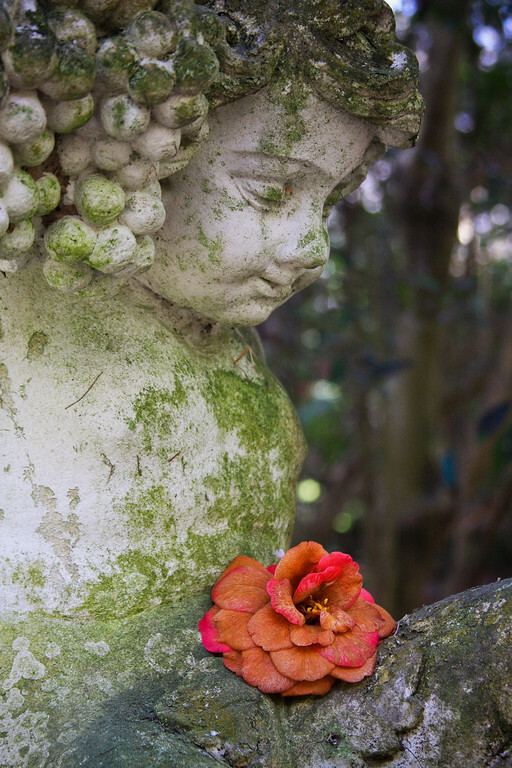 Check the web site for more info about their magical healing experience. Me? I am pleased with my sweater. Before & After - Spring St. The little hat shop has gone through quite a transformation since I walked up wondering if it was the building I should buy and live in happily every after. At that time I wrote this entry. 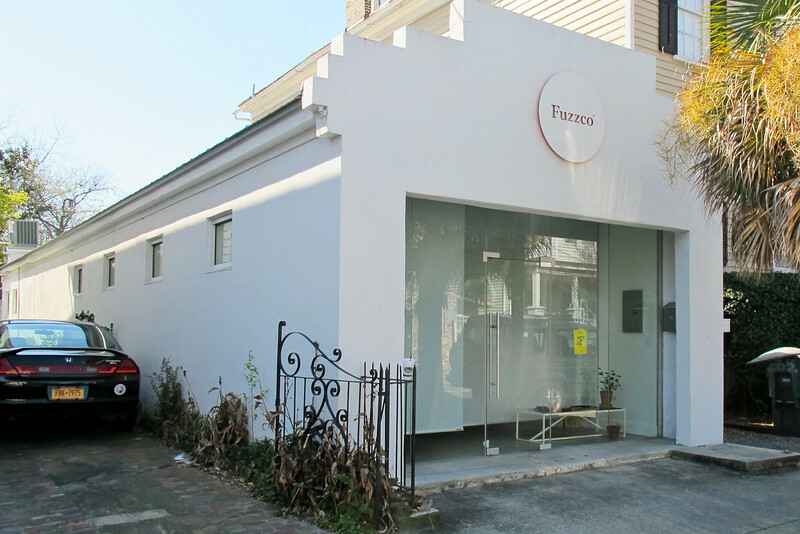 Internet branding company Fuzzco turned the building into a stylish office space featured in remodelista here. Labels: Before and After, Spring St.
My ice coffee at Persimmon Cafe, Calhoun St., Charleston,S.C. If you like it then you gotta put a dollar on it! Support local business. I liked the idea that a coffee shop had opened inside of the College Laundry on Calhoun St. so much that I looped my Saturday morning walk in that direction and ordered an ice coffee. Perfecto! Thanks Robert. 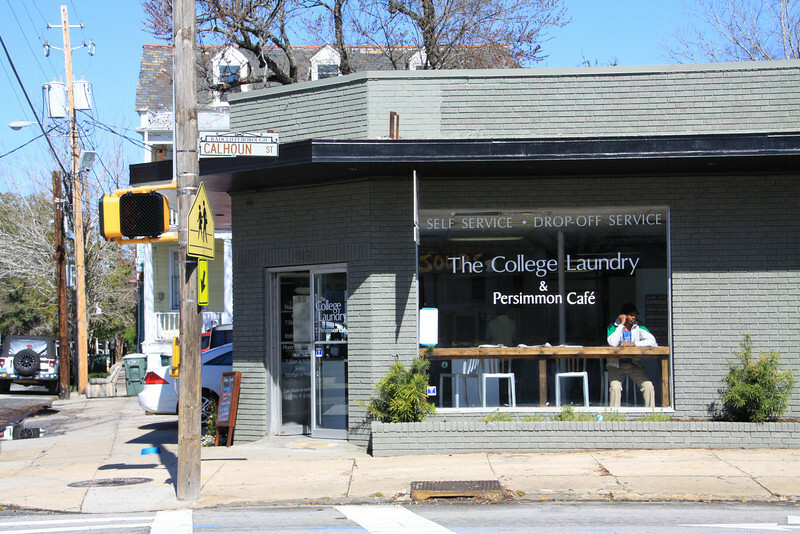 Eater Charleston: Charleston's newest coffee shop is tucked inside one of downtown's most visible laundromats. 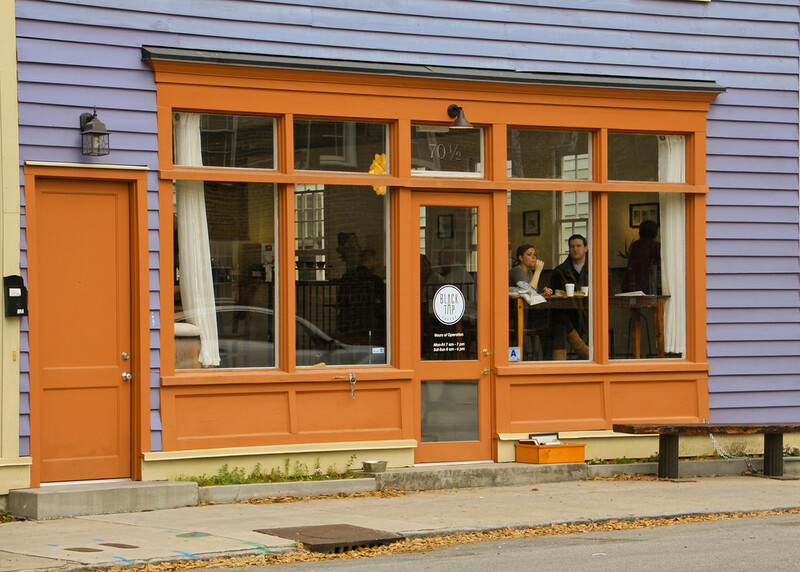 Owned by Robert Cassi, who recently helped open Mount Pleasant's Sesame Burger, Persimmon Café is located in the corner of the facility that once housed a soda machine. Instead of vending Coke products, a press release announced the space is now "a walk-up counter service café that specializes in local ingredients & an ever changing menu. 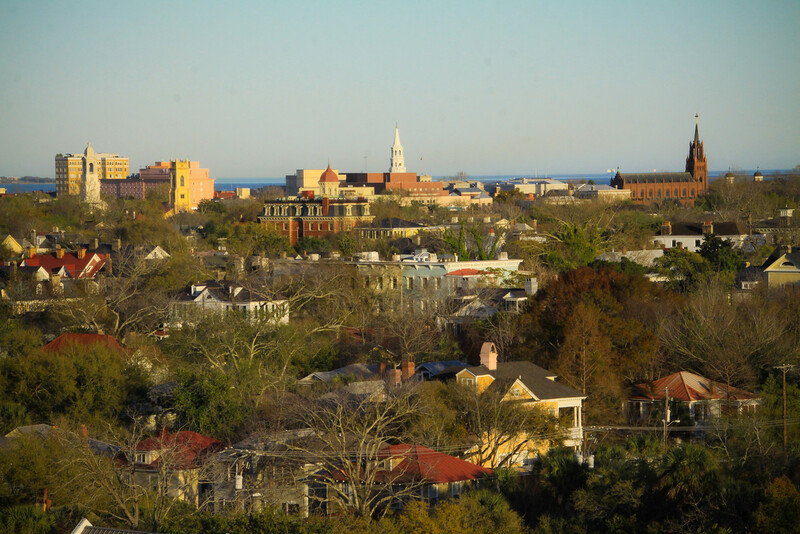 We offer Charleston Coffee Roasters coffee with organic choices." 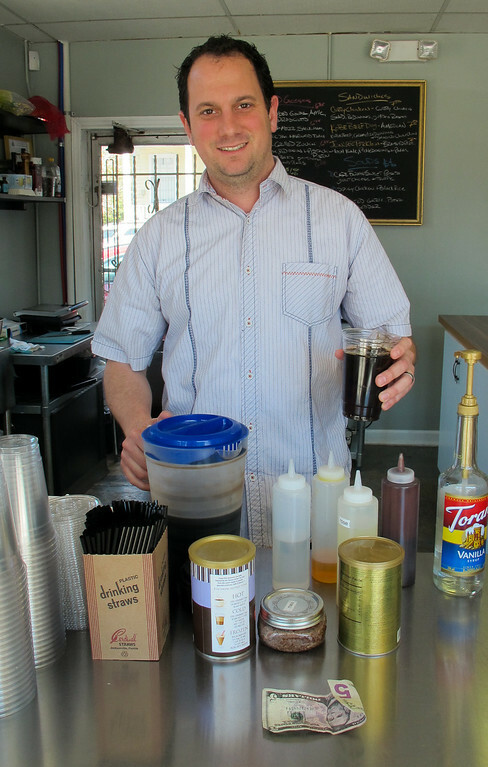 They are also serving a variety of sandwiches on bread by Charleston carb hotspot Brown's Court Bakery, soups, bagels, gourmet popcorn and non-coffee drinks, like basil lemonade.